Stephen Menendian returns to (finally!) publish an update to his inspired Legacy Doomsday that many of you have been clamoring for! More importantly, he’s here to test your skills, challenge your knowledge of the format, and expand your mind as he takes you to your wit’s limit with five brilliant and progressively difficult puzzles. 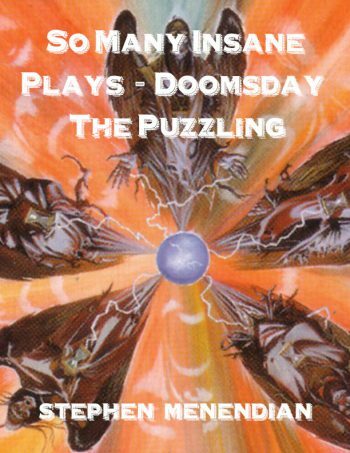 Modeled after Mark Rosewater’s famous column, the “Puzzling,” these brain teasers will provide hours of entertainment as you examine the complex, intricate, mind-boggling possibilities with Doomsday! Each puzzle is based on game situations that might actually arise in Legacy tournaments. You’ll find yourself coming back to these puzzles over and over again for insight and fun! The beautifully rendered layouts and easy to follow narrative make this an article you cannot miss! As a lover of the game of Magic, I must also enjoy puzzles. Seen from a certain point of view, almost any game state within Magic can be viewed as a puzzle. You decipher relevant information from scattered clues. You employ deductive logic to eliminate choices and narrow your options. Induction, also, is a part of Magic: guessing what your opponent might have in hand based upon what is likely in their deck, and based on what they’ve played so far. Every game state, every battlefield, and every scenario invites us to perceive more than is apparent – to delve below the surface, acquire insight, and thereby secure victory. One of my favorite Duelist columns was Mark Rosewater’s The Puzzling. Inquest Magazine also featured a similar column. The most memorable columns presented situations so dire and grim that defeat seemed imminent, and nothing you could do would possibly prevent it. Yet, as fun, intricate, and compelling as these exercises were, there was always an element of unreality to them. They resembled Magic, but they didn’t feel like a normal game of Magic. The situations were often so absurd and far-fetched that it strained the imagination to think that they might actually arise even in casual play. A good measure of suspension of disbelief accompanied most of the good Rosewater puzzles. The best puzzles are the ones that not only stretch our minds and challenge our intellects, but do so in an environment or context that is believable and relevant. Fortunately, Eternal formats supply such a context. 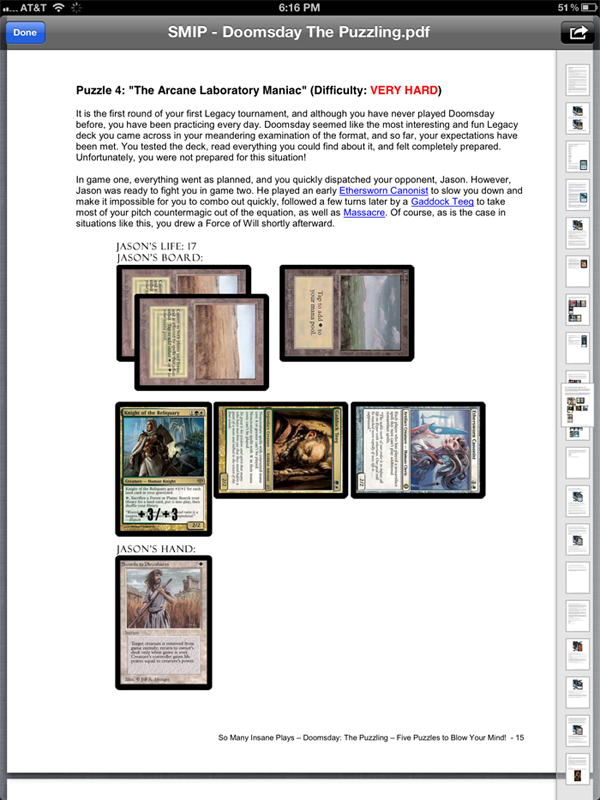 The Eternal player, especially the combo pilot, can distill the basic elements of a game in the terms of a puzzle: an opponent’s countermagic and disruption, your limited mana and resources, and a single turn or two to manipulate your cards. These elements eliminate lines of play and narrow your decision trees to the most exacting and precise branch. The relevant aspects of an opponent’s deck can often be reduced to a series of simple questions. What is your plan if your opponent has Force of Will? How do you beat a Thalia, Guardian of Thraben? How do you play around Tormod’s Crypt? And so on. And so it is possible to devise puzzles that are not only challenging and interesting, but also realistic and pedagogical. 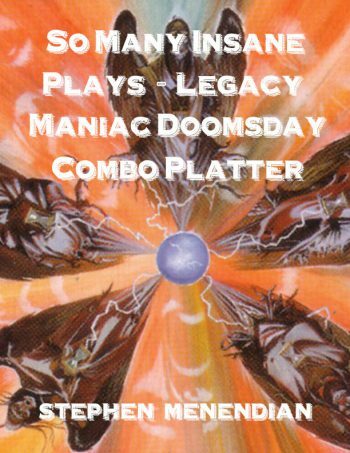 For your entertainment and education I have devised five puzzles of increasing difficulty for the Legacy Doomsday pilot. One of my favorite aspects of the game is solving real world puzzles. I hope you enjoy these as much I would.